Note to editors: A photo is included with this press release on Marketwired's website. Bombardier delivered a new Global 6000 aircraft to Formula 1 champion, Niki Lauda, today at the aircraft manufacturer's Global Completion Centre, in Dorval, Canada. 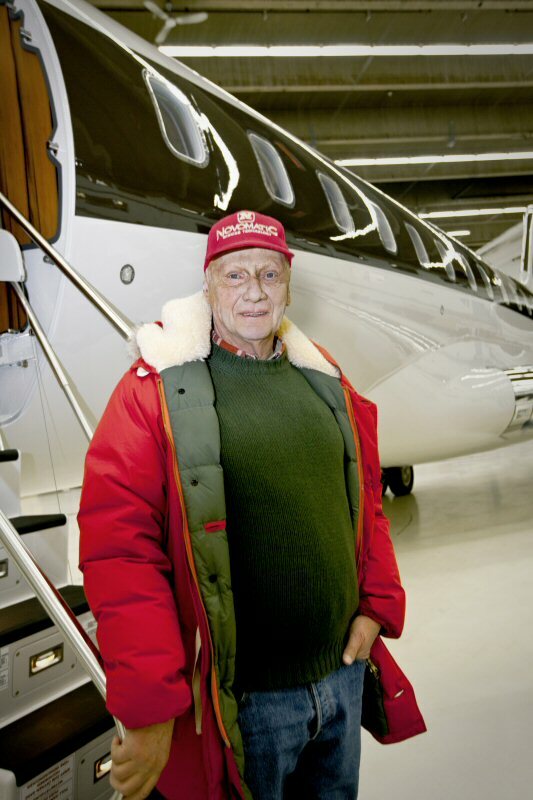 The company further announced that Mr. Lauda will be a spokesperson for Bombardier Business Aircraft. The partnership between Bombardier and Mr. Lauda will see him fly his new Global 6000 aircraft to Grand Prix races around the world with appearances at Bombardier Business Aircraft events throughout the 2015 Formula 1 season. "We're thrilled to deliver our highly successful Global 6000 business jet to Niki Lauda," said Éric Martel, President of Bombardier Business Aircraft. "We are also privileged to be working in close collaboration with Mr. Lauda - like our Global aircraft he set the benchmark for outstanding performance and achievement." "I had the wonderful opportunity to tour Bombardier's Global manufacturing plant in Toronto, recently, and I am impressed with the expertise, craftsmanship and innovation that go into building every Global aircraft," said Niki Lauda. "From a pilot's perspective, the Global 6000 aircraft is fast and fun to fly - it's a performing business jet that delivers impressive range and reliability." Three-time Formula 1 World Champion Niki Lauda has a long history in aviation. He was the founder of Lauda Air in 1979, and in 2003, he founded NIKI Luftfahrt GmbH, a low-cost airline based in Vienna. The Global 6000 jet is the latest in a series of Bombardier business aircraft that Mr. Lauda has owned and piloted during his career as an aviator. Until recently he operated a Global 5000 and Challenger 300 jet as his private aircraft, which he frequently used to travel to Formula 1 races around the world from his home base in Austria. As Niki Lauda travels the world, he will be supported by Bombardier's industry-leading services and support teams who are ready to provide on-site assistance to customers at a full range of events worldwide. No matter where our customers travel, experienced and quality care is always nearby. Global 6000 aircraft: The Global 6000 business jet offers more cabin volume and more floor space than any other aircraft in its class. No other business jet in the ultra long-range segment today matches the high-speed range capability delivered by this aircraft. Offering the ultimate in cabin comfort, this impressive jet can link Vienna to Brasilia non-stop with eight passengers and three-to-four crew*. It can travel 6,000 nautical miles (11,112-km) at M 0.85 with up to eight passengers*. Bombardier is the world's largest manufacturer of both planes and trains. Looking far ahead while delivering today, Bombardier is evolving mobility worldwide by answering the call for more efficient, sustainable and enjoyable transportation everywhere. Our vehicles, services and, most of all, our employees are what make us a global leader in transportation. Bombardier is headquartered in Montréal, Canada. Our shares are traded on the Toronto Stock Exchange (BBD) and we are listed on the Dow Jones Sustainability World and North America Indexes. In the fiscal year ended December 31, 2014, we posted revenues of $20.1 billion. News and information are available at bombardier.com or follow us on Twitter @Bombardier. Follow @Bombardier_Aero on Twitter to receive the latest news and updates from Bombardier. Bombardier, Challenger 300, Global, Global 5000, Global 6000 and The Evolution of Mobility are trademarks of Bombardier Inc. or its subsidiaries.